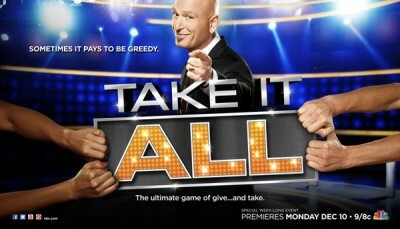 Howie Mandel is back with a new game show on NBC, Take It All. Will this one stay on the air for years like Deal or No Deal or, will it be quickly canceleld instead? We’ll have to wait and see to find out. The first season of Take It All is being aired on various nights on NBC. The network has ordered seven episodes. Below are the TV show’s latest ratings for the first season, the best way to tell if Take It All will be cancelled or renewed for a second season. 1.2 in the demo (+9% change) with 3.93 million (+16% change). Season averages: 1.50 in the demo with 4.84 million. 1.1 in the demo (-50% change) with 3.40 million (-53% change). Season averages: 1.65 in the demo with 5.29 million. 2.2 in the demo (0% change) with 7.18 million (+1% change). Season averages: 2.20 in the demo with 7.18 million. 2.2 rating in the 18-49 demographic with 7.12 million total viewers. Season average: 2.2 in the demo with 7.12 million. What do you think? Do you like the Take It All TV series? Do you think it should be cancelled or renewed for a second season? Most mean spirited nasty show I have ever seen. If this show is a success then the U.S is doomed. I felt dirty watching it by accident. Best game show on T.V. hands down. Hope it is on for years to come. this is the most irritating show i have ever seen , whoever created this show should know it cant stay on air for long , i think the show should change how the last two contestant agree on prizes. and bring back the four contestants who were honest but got played. only then will the show have a huge success, and i will watch it always. but for now , i will never watch again, i just completely felt sorry for the people who lost a lot of money for being honest, if just doesn’t seem right at all. YES leave Take it all on the air!Me and my husband really enjoyed watching this TV game show.It really was fun playing along online. This show was better entertaining then Deal or no deal.Howie is the greatest TV game host their is.Go NBC add this game show to the directory! Your 7-year-old daughter’s emotional reaction and conscientious words show that she has healthy empathy and caring for others, and has a sensitive heart for how we should treat each other. Your consoling your daughter and your explaining to her that you both will no longer watch this hurtful, lying TV junk proves that you have good values and are being a loving and wise parent to your daughter. I respect both you and your daughter, and I wish you both the very best! I hope there is nobody in your life who trusts you, because that would obviously be a mistake. So many negative comments here. This show is good because if you ever had a job in america you know what it takes to be successful. Yes it is a true fact people lie cheat and steal and are disgusting human beings. Almost like roaches scattering about doing anything to get what they want out of life. You hate it because you see yourself and the world the way it really is. Then if you feel this away your child shouldn’t watch it! Shirley, I agree with you completely. Christy, I think this show has a bad-morals effect on anyone and everyone who watches it, not just on children. Canceled or renewed? It may not matter to me at all, whatsoever. Hope, Howie Mandel would return to “America’s Got Talent” this summer as one of the co-panelists. For being “just eight” years old, you can tell right from wrong and you know how people should treat each other. You have good values and good judgment. Thanks for making your comment to the “grown ups.” You are more mature than many of the so-called “adults” on the show “Take It All.” I wish you the very best! Bunch of disgusting human beings. Hate it. I know I’m just eight, but here is my opinion on “Take It All”: What are these people thinking? I liked the first couple of rounds (selecting prizes based on their value), but on the last round the lady lied. That makes me mad. Watching a person who was bullied lose everything to a bully is not fun. I was disappointed and won’t watch the show again. From the pure heart of a child!